The mutations in Plasmodium falciparum chloroquine resistance transporter (pfcrt), multidrug resistance 1 (pfmdr1), dihydrofolate reductase (pfdhfr), dihydropteroate synthase (pfdhps) and ATPase (pfatp6) genes were associated with anti-malaria drug resistance. The aim of this study was to investigate the prevalence of polymorphisms in pfcrt, pfmdr1, pfdhfr, pfdhps and pfatp6 in Yunnan Province. Finger-prick blood samples were collected from malaria-positive patients from Yunnan Province in 2009-2010. Single-nucleotide polymorphisms (SNPs) in the resistance-related genes were analysed by various PCR-based methods. A total of 108 blood samples were collected. Although chloroquine has not been used to treat falciparum malaria for nearly 30 years, 95.3% of the parasites still carried the pfcrt K76T mutation, whereas the majority of isolates displayed the wild-type pfmdr1 N86 and D1246 sequences. The molecular level of sulphadoxine–pyrimethamine resistance in P. falciparum was high. The most prevalent mutation was pfdhfr C59R (95.9%), whereas the frequencies of the quadruple, triple and double mutants were 22.7% (N51I/C59R/S108N/I164L), 51.5% (N51I/C59R/S108N, N51I/C59R/I164L and C59R/S108N/ I164L) and 21.6% (N51I/ C59R, C59R/S108N and C59R/I164L), respectively. A437G (n = 77) and K540E (n = 71) were the most prevalent mutations in pfdhps, and 52.7% of the samples were double mutants, among which A437G/K540E was the most common double mutation (37/49). 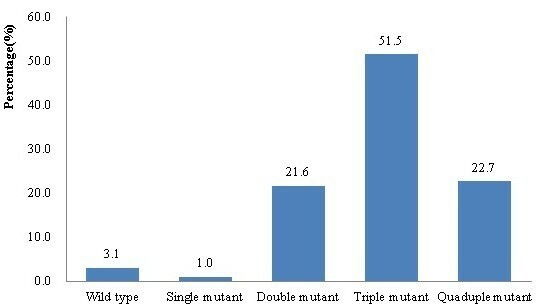 Quadruple mutants were found in 28.0% (26/93) of samples. A total of 8.6% of isolates (8/93) carried the S436A/A437G/A581G triple mutation. No mutations were found in pfatp6 codons 623 or 769, but another two mutations (N683K and R756K) were found in 4.6% (3/97) and 9.2% (6/97) of parasite isolates, respectively. This study identified a high frequency of mutations in pfcrt, pfdhfr and pfdhps associated with CQ and SP resistance in P. falciparum and no mutations linked to artemisinin resistance (pfatp6). Molecular epidemiology should be included in routine surveillance protocols and used to provide complementary information to assess the appropriateness of the current national anti-malarial drug policy. Malaria is a major health problem in Southeast Asia, where 1.3 billion people are at risk, and it causes approximately 120,000 deaths each year . Despite significant reductions in the overall malaria burden in the 20th century, the disease still represents a significant public health problem in China, especially in Yunnan Province . In 2010, the Ministry of Health in China launched an “action plan for malaria elimination”, with the goals of eradicating local malaria cases in regions outside of the Yunnan border area by the end of 2015 and eliminating malaria in the entire country by the end of 2020 . Falciparum malaria is now found in only two provinces in China, the Yunnan and Hainan Provinces . Malaria control measures have been actively implemented for more than 30 years, and considerable success has been achieved; there have been no local cases of falciparum malaria in Hainan in the past two years . However, the malaria situation in Yunnan Province near the Myanmar border remains serious. Yunnan Province is located in southern China; it includes 131 counties and borders Myanmar, Lao People’s Democratic Republic and Vietnam. 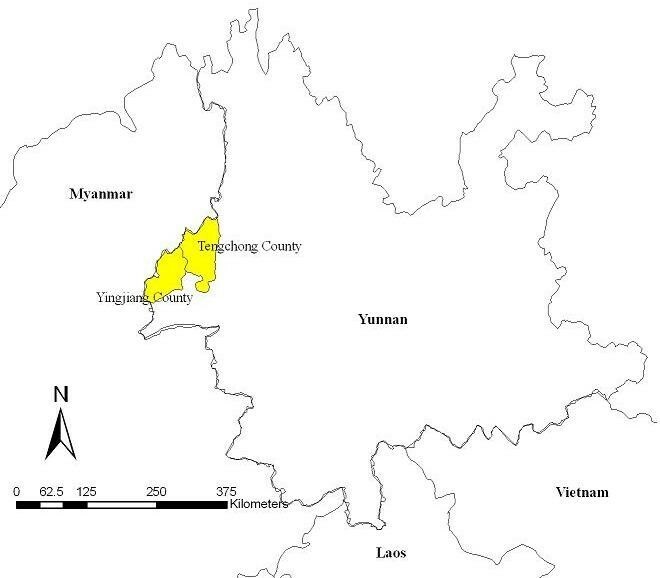 The majority of malaria cases are concentrated in several counties bordering Myanmar. The border with Myanmar is 1,997 km long and approximately 98 million individuals cross the border each year. Yunnan Province has an estimated population of 42.36 million, with about 35.52 million people residing in malaria-endemic areas. From 2005 to 2011, malaria incidence decreased across the province and the reported cases and deaths in the province population have declined from 13,239 cases and 37 deaths in 2005 to 1,216 cases and zero deaths in 2011. Of 2,643 reported cases, 28% were caused by Plasmodium falciparum. The first case of chloroquine (CQ) resistance in P. falciparum was found in Yunnan Province in 1973, and by the end of the 1970s, CQ resistance had spread widely [7–9]. Subsequently, sulphadoxine–pyrimethamine (SP) was introduced as the first-line drug for falciparum malaria treatment. This antifolate combination seemed to be an effective and reasonable alternative, but resistance to SP also developed soon after its introduction in China. Since 2001, the WHO has recommended the use of artemisinin-based combination therapy in all areas where P. falciparum is resistant to other anti-malarial medicines to optimize therapeutic effectiveness and delay the emergence of resistance. The WHO advocated a complete ban on artemisinin monotherapy for uncomplicated malaria in 2006 . The national drug policy of China was updated in 2009, and the first-line drugs currently used to treat falciparum malaria is artemisinin-based combination therapy (ACT), which includes dihydroartemisinin-piperaquine (DHA-PIP), artesunate + amodiaquine, artemisinin-naphthoquine phosphate and artemisinin-piperaquine . Many factors have contributed to the development and spread of drug resistance, including gene mutations and drug pressure . Molecular surveillance is a new technique that has been implemented over the past decades to provide complementary information to assess the appropriateness of current policies based on anti-malarial drugs . Several molecular markers of P. falciparum resistance have been identified. The K76T allele in the CQ resistance transporter gene (pfcrt) is associated with CQ and amodiaquine treatment failure and could be used for the surveillance of clinical CQ resistance [14–16]. The Y86 allele of multidrug resistance gene 1 (pfmdr1) has been linked with CQ and amodiaquine resistance . The role of dihydrofolate reductase (dhfr) and dihydropteroate synthase (dhps) mutations in the mechanism of resistance to SP drugs has been well described. Mutations associated with antifolate resistance have been identified in codons 436, 437, 540, 581 and 613 in the pfdhps gene and codons 108, 51, 59, 140, 16 and 164 in the pfdhfr gene. The quintuple mutant of pfdhfr (S108N, N51I and C59R) and pfdhps (A437G and K540E) were associated with a high relative risk of treatment failure, and this haplotype was suggested as a relevant molecular marker for failure of SP treatment in uncomplicated P. falciparum cases [18–21]. The sarco/endoplasmic reticulum Ca2+-ATPase ortholog of P. falciparum (pfatp6) was suggested to be involved in the mechanism of parasite resistance to artemisinin [22, 23]. Specific point mutations in codons 769, 623 and 431 were associated with artemisinin resistance . In recent decades, malaria drug resistance surveillance in Yunnan Province has relied on in vitro and in vivo tests, whereas molecular epidemiological studies of drug resistance have only been conducted as limited studies [25, 26] and have not been used as a routine surveillance tool in the national malaria programme. In this study, the prevalence of polymorphisms in pfcrt pfmdr1 pfdhfr pfdhps and pfatp6 genes in blood samples obtained from P. falciparum- infected patients in Yunnan Province were determined. The study was reviewed and approved by the ethics committee of the Chinese Centre for Disease Control and Prevention (China CDC). Blood samples were collected from patients with uncomplicated P. falciparum infection prior to drug treatment. All of the patients came from township hospitals in Tengchong and Yingjiang Counties in year 2009-2010. The initial diagnosis was made by microscopic examination of Giemsa-stained thick blood films or a rapid diagnostic test. For each sample, approximately 200 μl of finger-prick blood was spotted on a piece of Whatman 3M 903 filter paper and air dried. After the patients were confirmed as malaria, they would get DHA-PIP. The dried filters were stored in individual plastic bags at -20°C until DNA extraction. Parasite DNA was extracted from the blood filters using a QIAamp DNA mini kit (Qiagen, Valencia, CA, USA). Nested PCR [14, 20, 27] was used to amplify fragments of pfcrt pfmdr1 pfdhfr pfdhps and pfatp6. The amplified products were purified from an agarose gel and sequenced with an automated DNA sequencer (ABI systems, Perkin-Elmer, France). Sequence alignments and analysis were carried out using Mega and BioEdit software. Amino acid sequences were compared with wild-type sequences. The sequences of the amplicons were aligned with 3D7 strain published data from the NCBI database by BLAST analysis. Yingjiang and Tengchong Counties, which have the highest falciparum malaria incidence rates in China, are located in the Dehong and Baoshan Prefectures, respectively, in southwest Yunnan Province (Figure 1). In this study, four township hospitals bordering with Myanmar were selected to collect malaria samples. Of all of samples, 56 patients was local malaria cases and 52 patients were contracted from Kachin State of Myanmar. The location of Yingjiang and Tengchong Counties relative to neighbouring countries. Codons 71, 72 and 76 were successfully amplified in 106 of the 108 samples analysed. The mutation in pfcrt codon 76 was found in 95.3% (101/106) of parasite isolates, and mutations in codons 71 and 72 were found in 3.0% (3/101) of parasite isolates. The mutant haplotype CVIET in codons 72-76 was identified in 3% (3/101) of samples and 5.0% (5/101) contained the wild-type haplotype CVMNK. All of the samples were genotyped for pfmdr1 at codons 86 and 1246. The majority of isolates displayed the wild-type pfmdr1 N86 and D1246 alleles. A total of 5.6% (6/108) of isolates carried the mutant allele Y86, and 94.4% had the wild-type allele. No mutation in Y1246 was found. The single-nucleotide polymorphism (SNP) haplotype of the pfdhfr gene at codons 16, 51, 59, 108, 140 and 164 is linked with P. falciparum pyrimethamine resistance. The pfdhfr gene was successfully amplified in 97 samples, four of which contained amino acid substitutions compared with the wild-type sequence. The most prevalent mutation was C59R (95.9%). There were no mutations in codons 16 or 140. A total of 38 of 97 isolates carried the wild-type N51 allele, while 55 carried the mutant I51 allele, and four had mixed alleles; 93 and 58 of 97 isolates had mutant R59 and N108, respectively. A total of 18.6% (18/97) of isolates carried the wild-type I164, while 75.3% (73/97) carried mutant L164, and 6 had mixed alleles (Table 1). More than half (51.5%) of the isolates had triple mutations, including N51I/C59R/S108N (n = 35), N51I/C59R/I164L (n = 20) and C59R/S108N/ I164L (n = 21). The double mutants included N51I/ C59R (n = 5), C59R/S108N (n = 6) and C59R/I164L (n = 10). A total of 22.7% (22/97) carried quadruple mutations at codons N51I/ C59R/S108N/I164L, and only one isolate had a single mutation at codon R59 (Figure 2). Frequency of pfdhfr haplotypes in samples from Yingjiang County. The frequency of the constructed haplotypes of SNPs in N51I, C59R, S108N and I164L of the pfdhfr gene is linked with Plasmodium falciparum pyrimethamine resistance (n = 97). A total of 93 parasite samples were genotyped for pfdhps polymorphisms at codons 436, 437, 540, 581 and 613, which are associated with P. falciparum sulphadoxine resistance. The A437G (n = 77) and K540E (n = 71) mutants were most prevalent in pfdhps. A total of 52 isolates carried the wild-type S436 allele, and 41 had the mutant A436 allele. A total of 53.8% of samples carried the wild-type A581 allele, while 44.1% (50/93) had the G581 allele, and 2 isolates had mixed alleles (Table 1). Double pfdhps mutants were found in 52.7% of isolates (49/93). The most prevalent double mutant was A437G/K540E (N = 37), followed by S436A/A437G (n = 4), S436A//K540E (n = 1), A437G/A581G (n = 3) and K540E/A581G (n = 4). 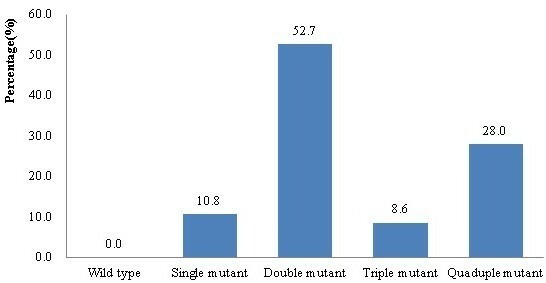 Quadruple mutants were found in 28.0% (26/93) of samples. A total of 8.6% (8/93) of samples were S436A/A437G/A581G triple mutants, and 10 isolates had a single mutation at A436 (n = 4), E540 (n = 5) or G581 (n = 1) (Figure 3). Frequency of pfdhps haplotypes in samples from Yingjiang County. The frequency of the constructed SNP haplotypes in the pfdhps gene at S436A, A437G, K540E and A581G is linked with Plasmodium falciparum sulphadoxine resistance (n = 93). Besides, the quintuple mutant of pfdhfr (S108N, N51I and C59R) and pfdhps (A437G and K540E) were shown in Table 1, which werewere associated with a high relative risk of treatment failure, and this haplotype was suggested as a relevant molecular marker for SP resistance. No mutations in pfatp6 codons 623 or 769 were found, but another two mutations (N683K and R756K) were found in 4.6% (3/97) and 9.2% (6/97) of parasite isolates, respectively. Yunnan Province has experienced considerable economic development in the last 10 years; based on the appearance of villages at present compared with 1999-2000, the standard of living, even in rural areas, has improved considerably. During this time, there has also been a significant decline in the number of malaria cases reported. However, suspected artemisinin resistance occurring in Mekong areas and difficulties for mobile population management in bordering areas will presents a challenge for eliminating malaria in the entire country by the end of 2020. Pfcrt has been demonstrated to be a major determinant of CQ resistance in P. falciparum, and the K76T mutation has been widely used as a reliable marker for CQ resistance in epidemiological studies [28–30]. Since CQ resistance was first found in China, it has spread widely, prompting the use of ACT to treat falciparum malaria. According to a longitudinal survey conducted in the Yunnan and Hainan Provinces, which are endemic for falciparum malaria, the resistance of P. falciparum to CQ declined progressively after CQ use was stopped or reduced, as determined by in vitro tests [9, 31]. However, the result of this study showed a high frequency of the K76T mutation of pfcrt, which is consistent with other studies conducted in China [25, 26]. Several theories have been proposed for the persistence of the K76T mutation. The most important proposed reason was the wide use of CQ to treat Plasmodium vivax. Although CQ has not been used to treat P. falciparum in China for more than 30 years, the stable and high prevalence of CQ resistance may be caused by the continued use of CQ as a first-line drug for the treatment of P. vivax. This factor may be responsible for the slow decline of P. falciparum CQ resistance in Southeast Asia, especially in the Mekong sub-region [32, 33]. Compared with the high prevalence of the pfcrt mutation, few samples had mutations in codon 86 and no mutations were found in codon 1246 of pfmdr1. This result was consistent with the findings of other researchers [25, 26, 34, 35]. The Y1246 allele of pfmdr1 was not related with CQ resistance, which was not consistent with the results in Africa . However, the prevalence of the mutation at Y86 was still high in parasite isolates from some countries in Southeast Asia. Pfmdr1 mutations differentially affected the CQ responses in CQ resistance parasites and their activities depending on the pfcrt haplotype to which they were associated [37, 38], and pfmdr1 gene copy number amplifications and most of the pfmdr1 gene amplifications in field samples harbors an asparagine at 86 amino acid position of pfmdr1 gene [39, 40]. Mefloquine has never been used in Yunnan Province, which would also be related to the low prevalence of mutation of the pfmdr1 gene. The role of pfdhfr and pfdhps mutations in the mechanism of resistance to SP drugs has been well described. Pyrimethamine was used for the radical treatment of P. vivax in combination with primaquine 40 years ago. Additionally, pyrimethamine added to salt was used for prophylaxis in the 1980s . Pyrimethamine plus primaquine has always been recommended as prophylactic medicine for specific populations in China . This study found that the prevalence of quadruple, triple and double mutant P. falciparum at the China-Myanmar border was still high. The finding of this study was similar to that in northeast Myanmar, Thailand and Cambodia, where highly mutated pfdhfr and pfdhps genotypes were also common [41, 42]. SP monotherapy was used for a short time after CQ resistance had spread widely, and artemisinin drugs were subsequently introduced and gradually became the standard of malaria therapy. However, it is unclear how to explain the discrepancy between the absence of SP pressure and the high prevalence of the pfdhfr triple mutants and pfdhps double mutants. it could be speculated that SP drugs were frequently used in bordering countries of the Mekong sub-region for long periods, and the frequent population migration across borders ensured high regional gene flow, including these drug resistance genes. The mechanism of action of artemisinin remains controversial.In vivo artemisinin resistance has been proposed  and identified by the presence of significantly decreased parasite reduction rates, manifested clinically by markedly longer parasite clearance times from the body [44–47]. The molecular basis for this phenomenon is uncertain. One of the proposed mechanisms is the interaction with the sarcoplasmic reticulum Ca2+ ATPase6. The analysis of naturally occurring polymorphisms in pfatp6 in field isolates suggested that a polymorphism at codon 769 may be associated with the reduced susceptibility of these isolates to artemether in vitro. Like other investigators, there were no polymorphisms in codons 263 and 769, described as the key amino acids for the interaction between pfatp6 and artemisinin . However, two mutations (N683K and R756K) were identified in parasite isolates in this study, which has been found in Zanzibar and Tanzania , and no mutation in position 683 has been published previously . Mutations observed in this study and previous studies [50, 51] could be indirectly implicated in artemisinin susceptibility. Although artemisinin resistance in western Cambodia seems to be a heritable genetic trait, none of the candidate genes suggested by earlier studies confer artemisinin resistance. A genome-wide approach using whole genome sequencing and transcriptome studies to identify the molecular basis of artemisinin resistance has been suggested . This study reports the high frequency of mutations in pfcrt, pfdhfr and pfdhps, which are associated with CQ and SP resistance in P. falciparum, but no mutation linked with artemisinin resistance in pfatp6. Although, molecular marker of artemisinin resistance has not been identified yet, this result of other in vivo tests in Yunnan Province (unpublished data) indicates that current ACT drugs for P. falciparum treatment are still effective. In addition, molecular epidemiology should be part of routine surveillance to produce complementary information to assess the appropriateness of the current national anti-malarial drug policy. We thank two anonymous reviewers for valuable comments and suggestions. This work was supported by the WHO Mekong Malaria Programme (WP/10/MVP/005837) and a project supported by the Chinese Centre for Disease Control and Prevention for Young Scientists (grant no. 2011A105). FH was responsible for the molecular genetic analysis and data interpretation and drafted the manuscript. LT was responsible for the overall study and was involved in all stages of this study, including its design. HY was involved in the study design and coordination. SZ performed several of the molecular genetic studies and data analysis. HL participated in sample collection. JL and SG carried out the molecular analysis and sequence alignments. All the authors read and approved the final manuscript.